The Odysseus Air XML is a “smart” API that provides much more than a simple “live” connection to check airline pricing & availability or to book a flight. 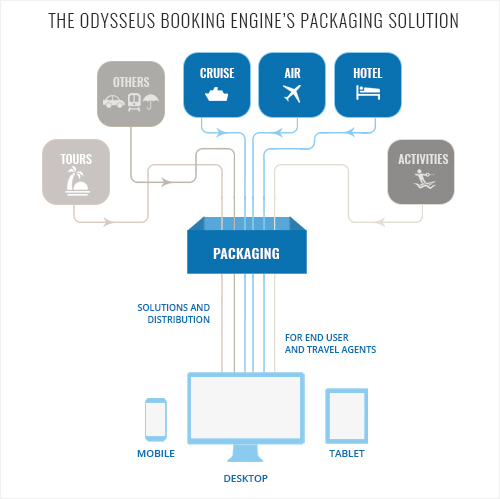 The Odysseus Booking Engine’s packaging solution provides the ability to combine air, hotel and cruise bookings as well as other travel products into custom travel packages. The optional packaging modules combine the various live Supplier connections Odysseus has with the Booking Engine’s dynamic and innovative rules engine. Clients are able to deliver the appropriate marketing message to their Users and the unique process flow helps them easily expand the products and services they provide their customers. The Dynamic Packaging module is an optional extension that allows agents or consumers to build their own unique travel package. It provides live pricing and availability for cruises, flights and hotels as well as other travel products and allows agents or consumers to build their travel package dynamically. The Custom Packaging module is a feature that allows Clients to pre-package a travel itinerary to be sold online alongside a cruise only product or individually. Product managers building a Custom Package use the dynamic packaging tools to price one or more products and then convert this custom itinerary into a Custom Package to be sold online.